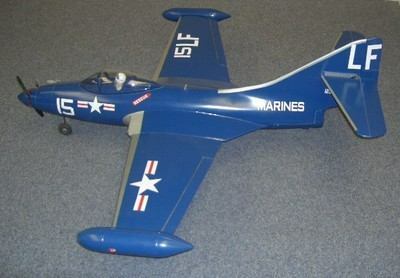 Cambrian bring you the iconic lines of the F9F Panther jet in kit form with terrific flight characteristics. Most employed on the American side during the Korean war ,this delightful 1/9 near scale model of a famous fighter that is a little different from the norm. Full aerobatic characteristics; inside loops, outside loops, axial rolls, inverted flight, all are possible with the Panther! Moulded canopies, cowlings, intakes, tail pipes and a variety of detail mouldings. Motor mounts, control cables, horns, clevices, etc. Span 50" (l.27m). L.O.A. 47". (1.19m). Wing Area 444sq in. Average Flying weight 5lb 8oz.